In Summer in the City, my first women’s fiction novel, I combined mythic, romantic Manhattan with a real-life Greenwich Village co-op apartment building. Why do this? Because people have fantasies of coming to New York and living in a brownstone on a tree-shaded city street, near the action yet sheltered from the hustle and bustle of this dynamic city. I happen to know a building in Greenwich Village that seemed very suited to the romantic tale of three Baby Boomer women reuniting for a summer in the city. I used some of the real features, such as the secluded backyard patio. The patio is where one of my heroines retreats late one night, trying desperately to hold onto the romantic memories of her first date. It’s where another of this story’s three heroines basically has a breakdown, where confrontations occur. And the patio is just for starters. Exciting events happen on the front steps, in the hallways, and in more than one co-op apartment in this building. A real building. Other scenes in this novel occur in public places in Manhattan, most of them unnamed restaurants and nightclubs I made up, but some of them at real places like the Metropolitan Opera, Rockefeller Center, and Central Park. Summer in the City is a novel that always makes me smile. It’s about new beginnings, recapturing the dreams of youth, straightening out the problems of long-term marriages, and more. True to its romantic fantasy core, my heroines always can find a cab when they need one, get a reservation to a hot new restaurant, and snag a last-minute ticket to a Broadway show, too. 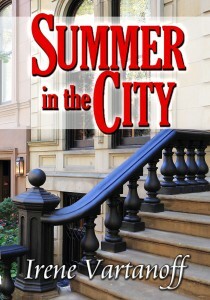 Summer in the City is available at Amazon.